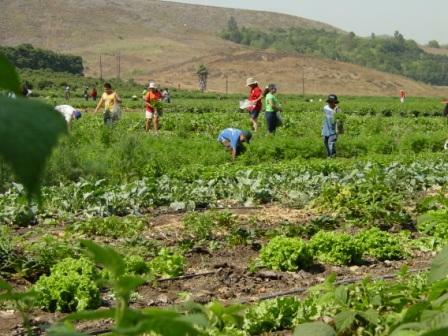 Many people want to know about our farming practices because of concern for food safety. Over the many years we have been farming, we have always done our best to find the most flavorful varieties to grow and use the best farming practices to produce them. We have chosen not to certify our farm "organic," but a descriptive term would be "sustainable." 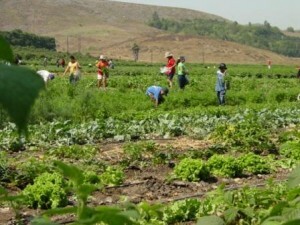 Our management practices incorporate many techniques that are integral to any good organic farm. We utilize compost on many of the acres we farm. We build organic matter and improve soil tilth (good soil structure) through the use of compost, minimum till, and cover crops. 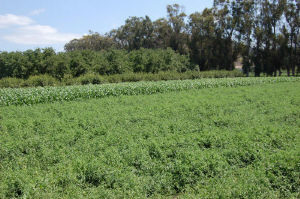 In lemons, we grow cover crops which promote an insectary for beneficial insects and nematodes. On the 60 acres on which we grow crops for our markets, we have planted native perennial and annual plants to attract beneficial insects. Selectively, we release beneficial insects and monitor their presence in the field as a weapon against the harmful ones. When we need to spray, we utilize organically accepted and least toxic chemicals, generally at an early stage in the plant's growth before it has developed edible parts and when it is most vulnerable to destruction by harmful pests. Many of the crops never require spraying. This approach to pest control is best described as IPM, or Integrated Pest Management. "Spraying" has developed a negative connotation. However, it is a tool used by virtually all farmers, whether organic or not. Sometimes we foliar feed (spray major and minor nutrient elements onto the leaf surface), which is a low impact way of meeting a plant's nutritional needs. Organic growers may only utilize biological and natural chemicals to kill the pests that attack crops, though they are still classified as pesticides. Conventional growers will use both natural and synthetic material to stop unusual infestations. The environment determines whether conditions are favorable for the buildup of disease or pests, or whether their natural enemies will keep them under control. Sometimes releases of beneficial insects are ineffective because conditions do not favor their survival. Our goal is to maintain environmental balance and promote conditions favoring beneficial insects. We use an insecticide when "bad" insects extend beyond the natural balance, and then only when necessary to save the crop. When we do use synthetic sprays, we have intentionally limited ourselves to those which have not been implicated as potential carcinogens. Holistic medicine is a favorable method for maintaining one's health. However, the tools of modern medicine are invaluable when the health system swings out of balance. That is the way we view the chemicals that are available for the control of pests and disease; use them sparingly and only when necessary to save the crop. It is more satisfying merely to observe the inter-activity of growing crops rather than intervene. Compost, cover crops, and rotation build soil health and microbial life. Fertilizers are used to supplement plant nutrition that may not be totally met by the natural reserves in the soil. I believe most people choose "organic" because of their concern about pesticides. Pesticides are not bad when used properly, just like antibiotics, chemotherapy, and a myriad of other drugs that are used to keep us healthy, pesticides are used judicially to keep plants healthy by organic farmers as well as non organic farmers. The difference is that organic farms can only use natural pesticides and fertilizers, not synthetic. Non-organic growers can and do use both. Cover crops provide rotation and organic matter to stimulate healthy soil biology. Crop rotation buffers the build up of soil diseases that affect each crop family. Release of beneficial insects partially control some pests. Soft materials don't upset the balance. There are many new bio controls. No magic bullet but natural antagonists. Almost all crops are irrigated with trickle tape. Frequent short watering uses only the moisture the crop requires. Soil sample and tissue samples determine plant nutrition needs. Fertigation minimizes waste and leaching. 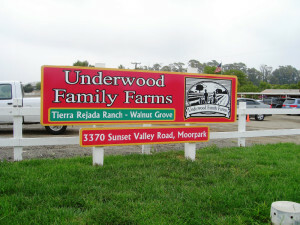 A formal food safety program has been adopted by the farm. UFF does not grow any GMO crops. That is not a statement for or against, but reflects the fact that some consumers have a prejudice against GMO and also there are almost no fruits and vegetables that are GMO. 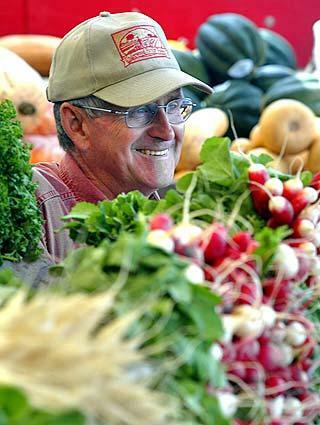 UFF sells directly to the consumer, thus providing the freshest possible produce through two farm stands, u-pick, farmers markets, and ag-promotional events.